Cork has become one of my favourite places to escape to – not that I need to escape very often. It’s just that when you work at home and don’t get out very much, a day trip can be a huge release and a chance to recharge the batteries for future endeavours. It’s even more fun when I get to spend that day trip with my husband. In addition to browsing around the shops and picking up some steel for my husband’s 3D Printing Business, we decided to see Captain America: The Winter Soldier. We’re fans of all the Marvel films and thought it would be a great idea to see the film in 3D and on the MAXX screen. Neither of us had been to a MAXX screening before, so we were very excited! We picked out our seats, bought snazzy blue 3D specs and prepared to be dazzled by the special effects. Then there was a hiccup . . . The screen went blank. The adverts were still playing at this point, so we didn’t worry too much. The picture was restored in time for the certificate information, but after that, there was a long pause before the familiar, bright, comic book pages of Marvel, filled the screen and announced the start of the film. Agitated mutters subsided, popcorn and sweets steadied the nerves – we were up and watching! Before you read on, let me just warn you that there maybe a few spoilers in my film commentary, so if you haven’t seen the film, head away, watch it and come back later! I was surprised to find myself riveted by Samuel L Jackson’s performance. I haven’t seen him in such a major role for a long time and he really demands attention. The car chase scene, where he is pursued to near death is one of the most thrilling in the film. I love the tete a tete between Jackson and the In-Jeep computer. Jackson keeps his legendary cool as he asks the computer why certain safety measures are not working. Apparently he influenced this scene, claiming that Nick Fury would be very controlled and not let loose with a machine gun until the moment was right. The chemistry between Chris Evans and Scarlett Johansson simmers at just the right temperature. Their best scenes take place as they flee the insidious ‘Hydra Movement’, which has infiltrated ‘Shield’. Johansson coaxes Evans into some distracting ‘couple’ poses, including a kiss on the escalator. The lift scene also deserves a mention. 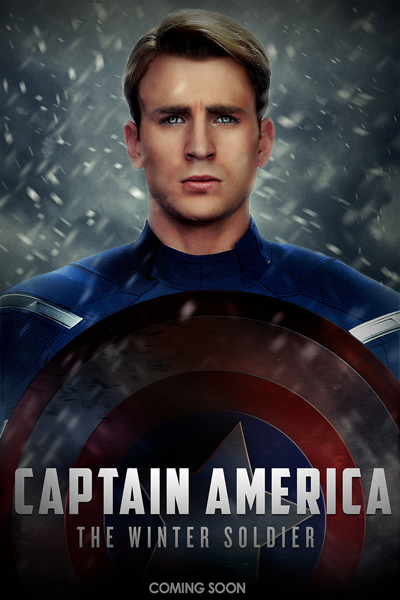 Chris Evans – Captain America, stands tall, politely greeting each new body that enters the lift, and believe me ‘body’ is the word as this gathering of muscles builds to full capacity and Evans asks ‘Does anyone want to get out before we start?’ And ‘start’ he does, putting the Shield into ‘Shield’ and leaving his attackers in a crumpled heap. According to a review on ‘Rotten Tomatoes’, the film contains some excellent martial arts moves. I’m afraid I found that the 3D and MAXX effect took away from these scenes, or perhaps I was a little too close? Any deftness of movement caused severe blurring of the action and I had to look away on several occasions, as a feeling very similar to motion sickness came over me! The film’s producers also seemed to have a keen interest in reviving aging talent. Robert Redford tackles a central, villainous role and I suppose he does a good job, as I found him quite dislikable. Jenny Agutter appears as Councilwoman Hawley, called to a conference at Shield in a key finale scene (watch out for a startling transformation on her part)! The Winter Soldier, himself, turns out to be more of a puppet than a true menace. It will be interesting to see what might be done with his character in the sequel, as he had very few lines in this particular film. And yes, there will be a sequel and it looks to have a gothic touch . . .